Located near the northwest corner of the Agriculture Administration Building's parking lot, the Trellis Entrance welcomes visitors to our Lane Avenue Gardens. 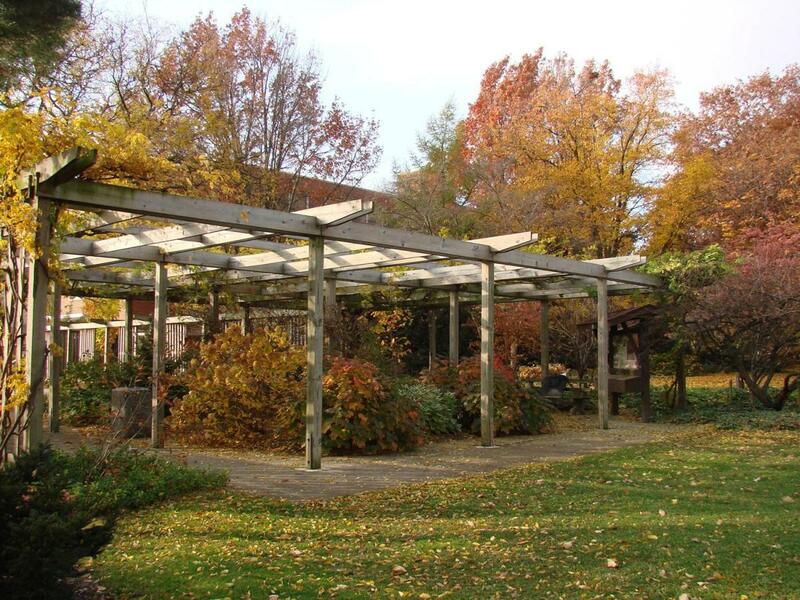 Now covered with wisteria, the first trellis and the kiosk underneath were built in 1980 as the gardens were moved from Campbell Hall on main campus to their new location along Lane Avenue between Olentangy River Road and Fyffe Road. Associate Dean Ken Reisch and Dean Ramsey, Emeritus VP of Physical Facilities and landscape architect were instrumental in creating the trellis area. The Agriculture Engineering and Construction Class removed the old trellis, updated it, and rebuilt it in its current location in 1998. This renovation was completed with support from Pi Alpha Xi and the David Long family, in loving memory of Carolyn Long. 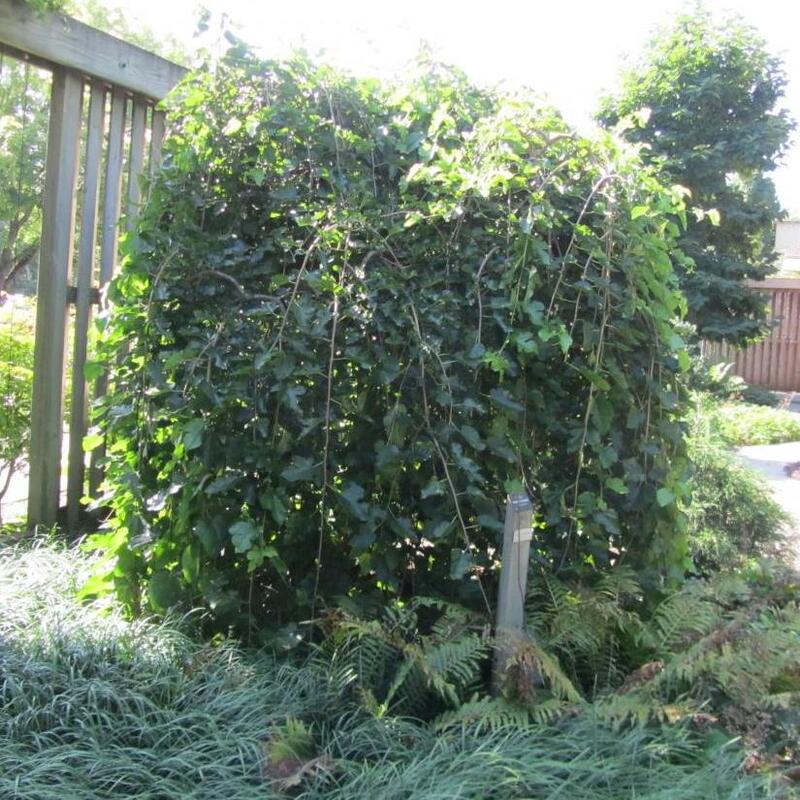 The spicebush located just inside the Lane Avenue Trellis Entrance was rescued from a local forest being cleared for a shopping mall by Mike Pfeiffer, Chadwick Arboretum horticulturist. Rescuing plants like this helps to preserve central Ohio forests, including local genetics. Lindera benzoin is a native deciduous shrub with a broad, rounded habit which typically grows 6-12 feet high. Clusters of tiny, aromatic, greenish-yellow flowers bloom along the branches in early spring before the foliage emerges and it displays beautiful yellow fall color. The leaves are aromatic when crushed and give it the common name spicebush. Spicebush is an important native woodland shrub that acts as host to many beneficial insects, including the spicebush swallowtail. Lindera is named for Johann Linder (1676-1724), a Swedish botanist and physician, and benzoin comes from an Oriental gum of the same name because the shrub has a similar spicy aroma and flavor. Click Plant Search Database and simply enter the botanical name (genus only will work) of any tree on The Ohio State University Columbus campus to view a photograph and one or more links to information from The Ohio State University Plant Facts, Wikipedia, and/or USDA Plants Database. If you do not know a tree's botanical name, you can find it by searching the web using the tree's common name. We are in the process of adding QR codes to our plant labels throughout the arboretum. If you are walking in the gardens and see a plant label with a QR code, use your smart phone or tablet QR reader app to access a photograph and description or link to additional information about the tree. If you don't have a QR reader app, you can download one for free from your app store.